Researchers at the University of Michigan have developed new molecular tools targeting the metal ions associated with amyloid-beta plaques—a surefire indicator of Alzheimer’s disease (AD)—leading them one step closer to a possible treatment for the disease. This research, recently published online in the Proceedings of the National Academy of Sciences, focused on the accumulation of misfolded proteins such as amyloid-beta plaques, a hallmark of AD, and their relationship to certain metal ions. “These amyloid-beta aggregates have been suggested to be involved in the neuropathogenesis of Alzheimer’s disease. Metal ion dyshomeostasis and miscompartmentalization also are thought to play a significant part in the progression of AD,” says Mi Hee Lim, PhD, an assistant professor at the University of Michigan, who led the project. Lim explains that elevated levels of metals (particularly iron, copper, and zinc) can typically be found in amyloid plaques. When these metal ions bind to amyloid-beta peptides, they facilitate the aggregation of amyloid-beta peptides and trigger the production of reactive oxygen species, which can lead to the disease’s debilitating symptoms such as memory loss and cognitive decline. “Metal ions stimulate amyloid-beta to clump into its toxic form. Any compound that blocks that interaction would be predicted to be beneficial in delaying, preventing, or treating Alzheimer’s,” says Sam Gandy, MD, PhD, a professor of neurology and psychiatry and Mount Sinai chair in Alzheimer’s disease research at Mount Sinai School of Medicine. To date, the specific role metal ions play in the onset and development of AD is not clearly understood, but Lim’s team has been working to uncover more information about this relationship with amyloid-beta plaques in hopes of unearthing the key to the disease’s treatment. While in earlier studies Lim and colleagues developed dual-purpose molecular tools that could both grab metal ions and interact with amyloid-beta, these new tools have been shown to not only disrupt the formation of clumps but also break up clumps that had already formed. Lim explains that these new compounds have a much greater potential to cross the blood-brain barrier, a critical parameter for brain applications. Where does this research stand and what does it mean in the realm of Alzheimer’s-related research? Through this research, Lim says her team hopes to gain a better understanding of AD, and she believes they are one step closer to developing a therapy for a disease that has proven incurable thus far. In a brain with Alzheimer’s, the fact that highly concentrated, localized metal ions can be found with amyloid plaques means metal ion homeostasis is not maintained. Lim says researchers (herself and other groups) have studied this disconnection, working toward a therapeutic approach called metal ion chelation therapy. “Using our chemical reagents, we will gain a greater understanding of the involvement of metal ions in Alzheimer's disease as well as contribute to the discovery of therapeutic agents—for example, metal ion chelation therapy,” says Lim. “Now, chemical tools and potential therapeutic agents have been devised and tested in vitro and in living cells. Moving forward, in vivo studies using these molecules will be/have been initiated in mouse models. 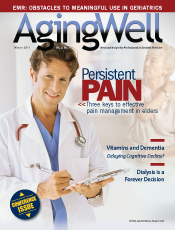 “Some traditional metal chelating agents such as clioquinol and PBT2 have demonstrated that they can provide less accumulation of amyloid plaques and cognitive improvement,” she continues. Yet this research is still in its infancy, with Gandy noting that PBT2 is currently in human clinical trials in Australia, and it is not without its challenges. While more research is necessary, Lim says these molecules could prove to be valuable in the treatment and/or the prevention of AD. “After invivo testing and blood-brain barrier penetration, our molecular tools can monitor the degree of metal-associated amyloid-beta species that could cause the development of neuropathogenesis [leading to diagnosis] and modulate/remove these metal-amyloid species in the diseased brain [leading to the improvement of pathology and treatment]. Also, our molecules can target early amyloid species in the monomeric form, thus can act as preventers of the initiation of the disease [leading to prevention],” she explains. Lim notes that in the future there’s hope that these tools could be utilized not just for AD but also for other neurodegenerative diseases. Because the main challenge with drugs targeting amyloidbeta is beginning treatment early enough, Gandy says this type of treatment may need to be initiated in midlife before cognitive decline even begins. What promise do these molecular tools hold for Alzheimer’s treatment and/or diagnosis? While Gandy says reversal of the disease is unlikely at the moment, he believes the greatest promise lies not in treating AD but in preventing it altogether. “Prevention is most likely to succeed,” he says. With this research, Lim says researchers could be able to move past at least one puzzle of such a mysterious disease: “Since these molecules are interacting with metal ions surrounded by amyloid-beta species, the mystery of metal ions in Alzheimer’s disease could be solved. New approaches in the development of metal ion chelation therapy will be initiated.” One puzzle solved for researchers could mean physicians are one step closer to offering AD patients a tangible treatment.